Aloha! Store will be turned into Pacific paradise for charity event | News by Wales Express News, People Before Profit! A department store in Wrexham will be turned into a Pacific paradise for an event to raise much-needed funds for a cancer charity. 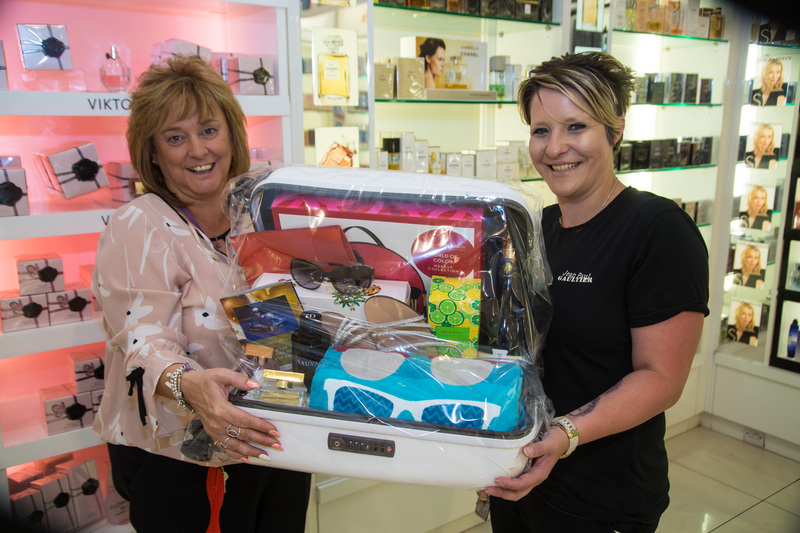 The Debenhams store at Eagles Meadow Shopping Centre is holding a Summer Beauty Club Evening next Thursday (June 7) and staff are hoping to raise more than £500 for the Look Good, Feel Better charity. It is the only international support charity that helps women and teenagers manage the visible side effects of cancer treatments such as hair loss. The event starts at 4pm and will run until 8pm. Showing off the prize hamper made ready for the charity Summer Beauty Club Evening are, left, Susan Reynolds and senior fragrance consultant Laura Clarke. Debenhams cosmetic supervisor Susan Reynolds says the event has an Hawaiian theme. She said: “We have lots going on and we are hoping to raise as much as we possibly can for Look Good, Feel Better. We have set a target of £500 but hope fully we can smash that on the night. “We have beauty tutorials with make-up and skin care experts giving advice that women who are being treated for cancer and have suffered hair loss will find particularly useful as it’s about drawing on missing eyebrows and eyelashes. She added: “We just want to continue raising all we can for Look Good, Feel Better which is a fantastic charity that helps women gain confidence and feel better about themselves. “We also have two guys coming down from Frankie & Benny’s here in Eagles Meadow who will be making complimentary cocktails for customers. It’s going to be a really fun evening that will hopefully raise a lot of money for a very worthwhile cause. “There will also be some summer party-themed refreshments and music thanks to a local Wrexham DJ and we might well have a few surprises up our sleeve. Steve Armstrong, who works behind the bar at Frankie & Benny’s will be helping head barman, Alfie Matthias, mix complimentary cocktails during the evening. Eagles Meadow Shopping Centre manager Kevin Critchley says he’s delighted to see Debenhams staff continuing to support the charity.